In a study that resulted in our book Comeback Churches (B&H Publishing), 324 comeback churches were surveyed in order to seek answers to the questions of what and how to make a comeback from a trend of spiraling downward, both spiritually and numerically. How did 324 churches start growing again after experiencing a pattern of plateau or decline? Based upon the information gathered in this study, some church change factors were perceived to be more important than others by comeback leaders. Leadership is the most important factor in making a comeback. Leadership is rated as the factor having the highest impact by comeback leaders. Leadership is about influence. Churches that are in a pattern of plateau or decline need strong leaders who will point the way to revitalization. Comeback leaders illustrated the truth that church renewal, in many ways, does occur based on strong, effective leadership. But what kind of leadership does the church need? Comeback leaders identified several important components of leadership in their responses—the development of an attitude of growth, intentionality and proactivity, shared ministry and the activation of a shared vision. Comeback leaders are not willing to settle for a slow or no-growth mentality; maintaining a small-church mind-set is not an option. They are willing to identify and make necessary changes and set growth goals. Survey respondents describe an environment where the ministry is shared with the people based up on a common vision. Vibrant faith is a significant factor in revitalization, particularly in three faith factors: renewed belief in Jesus Christ and the mission of the church, servanthood and strategic prayer. If the percentages hold true in the larger picture of North American churches, then what churches believe about the person and power of Jesus and about God’s mission for the church, how you follow Him as a servant leader and your prayer relationship really matter. Creating a renewed focus and emphasis on Jesus is vital to making a comeback. Believers need to experience the reality of Jesus Christ in their everyday lives. Then, in order to create an atmosphere of renewed belief, comeback leaders will want to find ways to translate that belief into practical activity. Laypeople becoming actively involved in meaningful ministry is a significant factor in church renewal. Creating an atmosphere of lay mobilization is very important in the revitalization process. Increased expectations, equipped people and empowered people are key components of developing an atmosphere of lay ministry involvement. Churches will want to be more intentional about their evangelistic efforts. Those churches that make plans to reach out to the people in and around their communities, and then, prepare people to engage in those outreach efforts will be more likely to experience renewal. In addition, churches should not necessarily expect to discover only one effective evangelistic strategy. 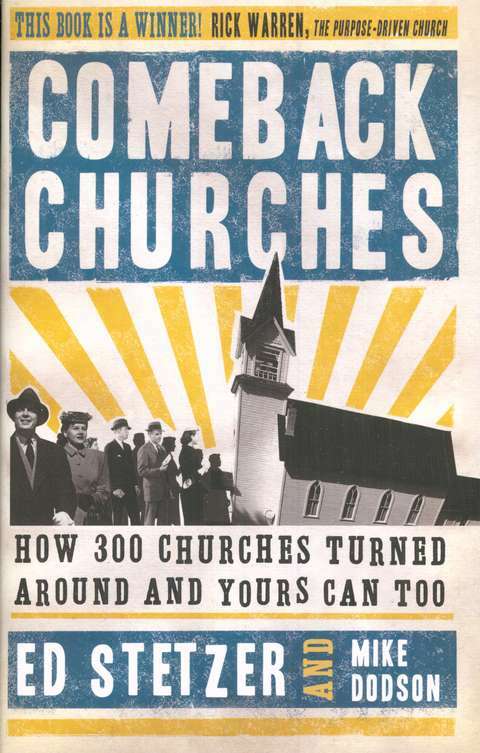 These 324 comeback churches used many different strategies and methods of outreach. Thus, the discovery of evangelistic methods or strategies that work best for a given church may take awhile to discover. Those churches that have the desire to be revitalized will want to engage in intentional outreach efforts, become active agents of community service and pray for the Spirit of God to draw people to Jesus. A “celebrative” and “orderly” mood of worship is a huge factor in revitalization. If worship in a church cannot be described as “celebrative” and “orderly,” then that church might want to consider exploring some ways to gradually introduce some new energy, enthusiasm and contemporary flavor into its worship experience. In some cases, churches and pastors might want to consider making changes in regard to other factors such as small groups, facilities and marketing, but these factors are not as important or influential as leadership, vibrant faith, lay ministry, evangelistic efforts and worship, according to the finding of this study. Overall, the most significant aspect of this study is that it proves revitalization can occur; 324 churches are comeback congregations. Revitalization can happen, and this study reveals some insights that will help churches that want to get on the comeback pathway. In one of the summary questions, survey respondents were asked to identify the biggest challenges they had faced in regard to making their comebacks. The two most prominent issues identified by comeback leaders were attitude and finances. According to some of the comeback leaders interviewed, these attitude issues can be addressed in practical ways. In many cases, an attitude of growth can be created by utilizing good tools and resources like the Purpose Driven materials. In all cases, an attitude adjustment toward growth will involve influencing people to change. Comeback leaders believe that attitudes can change. In regard to finances, money is always a necessary resource to conduct ministry and live life. Some plateaued and declining churches will perceive that a lack of finances in a major obstacle to revitalization. Some of the follow-up interviews reveal the need for prayer and creativity in overcoming the obstacle of finances. Keep thinking and reaching forward (Philippians 3:14). Don’t get stuck in the past, whether that means traditions or accomplishments. Too many churches choose their past over their future, their heritage over their growth and their traditions over their children. Simply put, churches need a fresh new vision because some ways of doing evangelism just do not work the same as they once did, and wise churches realize that. That may bother you, but it shouldn’t. You probably already know it to be true. That’s why, if you’re like most churches, you ended the morning radio show in the 1940s, quit doing Sunday school enrollment campaigns in the ’50s and stopped the bus ministry in the ’80s. God uses different approaches at different times. Our task is to find new ways to reach people with the unchanging message. Ultimately, it is just the gospel — and the gospel transforms, but God has led us to use different strategies over the years to help us share the gospel broadly and widely. Our churches need to press ahead toward God’s plan to reach their communities today, not the plan that was used in 1954. Set some God-sized goals and go for it. Every church needs to be dissatisfied with its current condition, not because it needs more numbers, but because each community is made up of people without Christ who need to be reached. John Knox cried, “Give me Scotland or I die.” We need to pray the same for Selma, Sellersburg and Seattle. Remember Jesus has commissioned you for this purpose. According to Ephesians 3:10, the instrument that God uses to make known His “manifold wisdom” is the church—your church. He placed you where you are for such a time as this. Stick with it. Not everything you try is going to work, but don’t quit. One of the keys to success is perseverance, not necessarily following the latest ideas and fads. Used by permission from Comeback Churches by Ed Stetzer and Mike Norman. B&H Publishers. Copyright © 2007. All rights reserved.